Deconstructing the NAR False Teaching on "Biblical Worldview"
Beloved, the Bible makes things very clear if you are willing to listen. It is one of the reasons why He said, let him who have ears actually hear. We are in the end times and the Bible tells us that there is only one thing that has the power to save man - the Gospel. The influences however of the NAR, dominionist false teachings has led a generation of church leaders to focus not on the Gospel but in changing the culture of a fallen world. 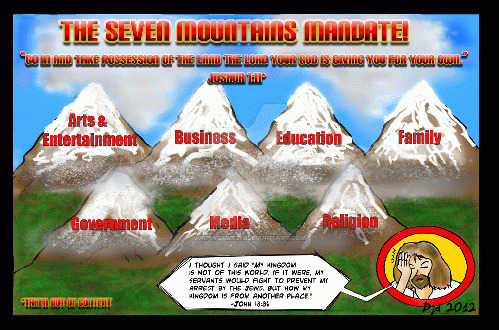 They speak unbiblically about conquering seven mountains of culture. The bottom line is that they, like Lot before them, pitched their tents toward Sodom and found themselves living in it. They like living in Sodom. They like the sin and excess. So they live not to save people out from the dying culture but rather to revive what was never alive to begin with. They speak about Christians having a "biblical worldview" but that view is blind to the truths of Scripture and is pursued at the expense of the Gospel. Beloved, there is no "cultural commission" we are called to fulfill. We are to be salt in order to preserve and light to lead people out of the culture. The shining city on the hill is not part of the world. It is separate. It is light in the midst of darkness. Mattera then throws a slew of Scriptures against the wall in the hope of lending piety to what is not Biblical. Genesis 1:28 is when God gives Adam and Eve dominion over the earth. Genesis 3:15 is the fall of man. Genesis 12 is the call of Abram. Genesis 17 is the covenant of circumcision and 22 is the Abrahamic covenant. I am going to stop here because none of these have anything to do with redeeming culture for the kingdom and glory of God. Genesis 1 was simply God telling Adam and Eve to fill the planet. There is nothing about 6000 years later and trying to influence culture. Genesis 3 is actually as prophecy about Christ. It has nothing to do with us at all, let alone us taking over the world. The call of Abram promises that his descendents will cover the earth but nothing about taking it over. The covenant of circumcision was to mark the people of the Lord as His and 22 again is that the descendents of Abraham will be like the sands of the shore. To take these Scriptures which have so much individual meaning and co-opt them for your world conquering dreams is more revealing of the deceitful wickedness of the human heart. Revelation 21 and Isaiah 65 tells about the new heavens and earth! These are not the result of Christians taking over the old but rather the old one passing away! The name of King of Kings is from Revelation - when Jesus returns to the earth and yes He will judge all nations. All of these things however have zero to do with talking over the world now. It is important that the church today understand the definition of ekklesia. The church needs to see itself as being "called out" by God. If the church wants to make a difference in the world, it must be different from the world. Salt is different from the food it flavors. God has called the church to be separate from sin (1Peter 1:16), to embrace fellowship with other believers (Acts 2:42), and to be a light to the world (Matthew 5:14). God has graciously called us unto Himself: "'Come out from them and be separate,' says the Lord. 'Touch no unclean thing, and I will receive you'" (2Corinthians 6:17). - Got Questions? If the church wants to make a difference in the world, it must be different from the world. Not try to influence it, find relevance to it, or conquer it. Mattera now lists eight steps he thinks Christians need to take to accomplish this heretical societal transformation. "1. We need to have a biblical worldview for every realm of contemporary life. Because we are made in the image and likeness of God (Genesis 1:27), we need to learn how to think God's thoughts after Him. In other words, our thoughts should be derivative of Father God's word and not merely our own subjective autonomous opinions. When we fully explore what the Bible says and agree with its general principles regarding history, law, psychology, education, religion, politics, economics, family and science, then we have a biblical worldview that serves as our lens that interprets all the data we inhale. No. No. A thousand times no. if you truly want to think like God, read your Bible and if you do you will realize this teaching is not in the Bible. It is just another humanistic logic and thinking that leverages Scripture fragments to appear as if it comes from God. We can see just from his conclusion here that his goals is not focused on heaven but rather on how many Christians are serving in the world. The reality is most Christians acquiesce to secular mindsets because the church acquiesces to the world.